Ever think about taking your dog on a hike? If you’re the adventurous type and want to bring your furry friend along, you’ll need a special type of harness to ensure its safety and comfort. 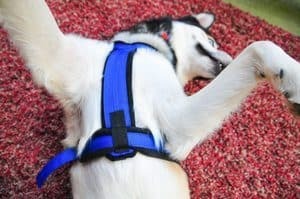 Finding the right gear in 2019, such as a dog harness can be a little tricky. So, there are a few factors you might want to consider when shopping for the right one. First, consider the build of your pet, large or small, because the market is filled with harnesses that fit them differently. Also, before purchasing, you want to review the materials that the harnesses are constructed with. 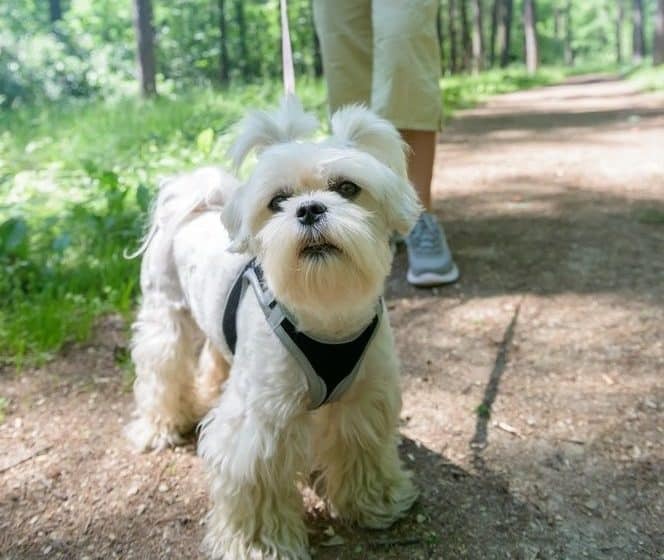 Some are more durable and suitable for the outdoors than others, and some use material that is more flexible, breathable, or comfortable compared to other dog harnesses for hiking on the market. The last thing, as you shop around, you’ll want to compare the safety features of the various harnesses for hiking before you decide to make a purchase. For instance, straps with visibility (lighting) are important, especially for smaller pets that are difficult to see outside in the dark. 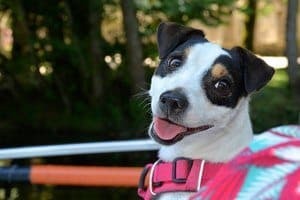 Since the market is packed, I’ve researched all the best dog harnesses for hiking so that I can help you pick the right one for your pet. a nylon material and mesh fabric on the inside. The nylon gives this product durability while the mesh material makes them comfortable. This strap can be easily put on and pull off by removing the safety lock that goes around the pet’s belly. The band that goes around the neck portion of the harness is adjustable, so your pooch doesn’t choke even if it pulls the leash. The Earth Vibes Petfly also features a handle that’s made of nylon. The handle allows you to control or lift your pet with the harness whenever it needs a little help from you. The stitching on this item gives light to make your canine visible when it’s dark. This product also has a D-ring that you can connect with a leash. The combination of features and overall quality make the Earth Vibes Petfly ideal for hiking, running, and walking. Make sure to measure your pet carefully to pick the right size that fits comfortably. We consider this harness to be the most comfortable one. This is one of our top choices in 2019. Especially if your dog tends to pull on its leash. The reason why most owners choose this Ruffwear product is due to the two leash attachment points. One is near the front of the harness, which is for controlling your dog, especially if he or she likes to pull while you’re both going for an adventure. The other attachment is on the back of the strap, which is for canine’s that don’t typically pull on its leash. The Ruffwear Reflective attachment is made of aluminum, and it’s reinforced with webbing. This allows a safe and reliable connection to your dog. The handle featured is padded, so your pet is comfortable in the strap. It assures load dispersion throughout the dog harness, so he or she is comfortable even when you lift it off the ground. Its straps are also padded, which means your dog can wear it for hours at a time without causing any irritation. This gear is adjustable, so it can fit perfectly. The Purebox is one of the easiest ones to use. They take a few seconds when it comes to putting one on and pull off, and ideal for dogs who don’t like to wait. They’re made of reflective nylon material that’s long-lasting. Also, this comes with a quality D-ring and leather handle. These two features provide reliability even if your pet pulls on the strap while walking. What makes the Purebox great is that it brings a lot of light and so it’s ideal for when you two are out in the dark. This harness is lightweight, has a mesh lining, and sponge padding. This product come in different sizes, so all you have to do is measure your dog to make sure you get the perfect fit. The Purebox has a quick-release buckle and a locking feature to ensure safety at all times. Also, the two buttons provided allows you to adjust the size even better. This dog harness for hiking is not suggested for pet owners with small dogs, but more so suitable for large breeds. This lightweight strap is ideal for larger breeds that love to go on adventures but need a little help here and there. It’s adjustable, and its straps allow you to create the perfect fit for your pup. The straps are reflective, so you can go hike or walk in the dark without fearing your dog’s safety. The material on this gear is breathable, and it has padding, so your pup is comfortable at all times, whether you’re walking or hiking. Overall, the Philwin can be easily used thanks to its simple design. This product has safety buckles and a locking feature on them to ensure safety. This outdoor product is wear and dirt resistant, and it’s almost impossible to get tangled in a knot. The design evenly distributes the weight, which is ideal for canines who pull on their leash. The two leash attachments are on the back and chest, and made of metal. The K-9 Tuff is made of durable 600D oxford fabric and polyester with foam padding. On top of that, the D-rings are stitched with heavy duty stitching. This combination ensures the quality, comfort, and durability of the belt while you’re hiking. This product can be easily used since it has quick-release buckles and takes only seconds to put on and take off. The handle is placed right in the middle of the strap so you can lift your dog when needed. The straps around the neck and chest portion is adjustable and provides comfort and safety. The product also features reflective nylon webbing that’s great when you guys are out at night. This belt comes in many different colors and sizes to choose from based on your preference and the size of your pet, both large and small. You may need to buy a size larger since this one runs a little small. If you love taking your pup hiking a lot or just enjoy long walks with mans best friend, then you are going to need a reliable dog harness suited for your needs. Great for both medium and large dogs, this saddle-shaped harness will provide a lot of storage for anything you would like to take with you on your journey. Made of very comfortable cotton canvas, this product will not irritate your pet’s fur or cause them any discomfort at all. It was many functions and can be used for many things. You can even put all of your hiking belongings in it so that you would not have to carry it yourself. Another thing to keep in mind when considering this product is that it is very lightweight therefore will not be a nuisance to your pet. OneTigris comes in 5 different colors/designs all meant for blending into the surroundings of your hike. Mihachi makes a reflective canine harness that will keep your pet secure because it is escape proof. The reflective design will keep your pet safe or stand out if it is lost because if a light is shined on it, you would be able to see where your pet is! Another great thing to note about this harness is that it adjusts in five different places which allows you to customize the fitting that it will have on your pup. The handle that is on the top of the item will let you pick up your pet if it ever cannot get over an obstacle or anything like that. Mihachi is padded and gives good support and comfort to your pet to ensure that they are comfortable during the whole trip. The sizes come in both medium and large which can be adjusted to match your pet’s specific body shape. This very reliable Pawaboo canine backpack is made with a lot of roomy pockets and storage areas to put your hiking supplies. Great for larger pets, this adjustable saddle bag gives you plenty of room to bring along any supplies you may need for hiking without having to carry it yourself. The adjustable straps are great at keeping everything in place and will help the harness to stay put on your pup throughout the whole travel. It is made of very soft fabrics that will keep your pet in a state of comfort while it is wearing the harness. The many pockets will be great for holding keys, phone, water bottles or whatever else you would like your pet to carry for you. The three different colors this comes in includes black & gray, blue & gray, and orange & gray. It is also made with breathable fabric so your pet will be able to sweat and cool down as needed. Kurgo also makes a well designed reflective pet walking harness that is specifically made for trekking around with your animal. Coming in different colors and designs, this product serves an excellent purpose for very active dogs. If your pet loves to adventure in the outdoors, then they will love the comfort this harness can give them… they will forget they even have it on! The v-neck design gives their chests room to inhale and exhale without any restriction on their throat. 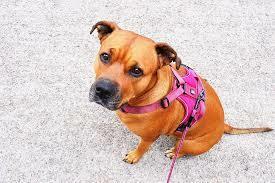 The harness is padded to make sure that the pooch wearing it is in total comfort the entire time it is on. The handle attached to the back of the pet backpack allows you to have more control over your animal and gives you the opportunity to help them over any tough obstacles they are unable to conquer. Kurgo makes their pet packs perfect sizes for any larger pets and will be a great comfort and convenience while on your hike. This brand makes a pet pack that both owners and the dog enjoy! It is made to simply be taken on and off without any hassle or stress. Made for both medium and larger breeds, this item comes in a neon green color as well as gray. The reflective and bright materials ensure that your pet will be seen by you at all times. The four different adjustment options on the harness help you to fit the harness specifically to your pooch so that they are secure and in comfort at all times. The chest and stomach pieces are padded with extra padding to keep your pet cozy at all times. Instead of a handle at the top, it has a secured leash attachment where any leash you own will be able to connect to the product. Exercising, whether it is running outside or walking your favorite trail, is an essential part of a healthy lifestyle. Hiking not only allows you to get out of the house but it also helps your pup to stay active. This is especially important if your pet is kept in the house all day while you’re out or at work. Not to mention, it gives you and your pet time to work together and bond. Like any hobby or sport you’re involved in, it is crucial to be well-equipped with the appropriate gear. So if you and your furry companion love going on outdoor adventures, we strongly you look for various dog harnesses for hiking. Yes, you can use a standard restraint like one for walking or running, but nothing can replace the quality and effectiveness of one you would use for any hiking activity. For us, we love to go camping, and so we always make sure that we bring these specialized harnesses. So don’t settle for just any product or be afraid to splurge on your pet, pick a harness that meets all of your preferences and needs. If you’re in the market for a harness made especially for hiking, then it is essential to know what you’re looking for. In comparison to the other harnesses that are meant for walking or running, your criteria for a hiking one will be slightly different. For example, you’ll want something heavy-duty in design since hiking is a more rigorous activity. So pay attention to its design, materials, safety features, and size before committing to a product. Remember, the more information you have, the less likely you’ll regret your purchase. What’s The Best Design for Your Dog? Keep your dog’s temperament in mind as you search for the right product. The goal is to find a product that is ergonomic, something that won’t cause discomfort or overly restrict the movements of your canine. But more importantly, search for a product that is reliable and safe. So, check the quality and quantity of the straps and hardware. Are the straps adjustable? How about comfortable? Do the buckles look cheap, and like they could possibly break under any duress? What about a dog harness with pockets? Is there a vest option available? Does it have a front attachment, back attachment, or both? The last question might not seem significant, but where you attach your leash or lead, whether in front or on back of the harness, does make a difference in how your dog walks and reacts. For example, attaching the leash to the front allows for the owner to have more control with the use of effective leveraging, which stops a dog from pulling as they walk, making it the ideal harness for pet trainers. 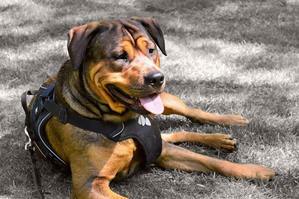 Whereas harnesses that have the lead attachment on the back, allow the dog to move around more freely as if it was hiking around with no restraint at all. This decision depends solely on your hound’s hiking experience. If they are new to walking trails and traversing mountainous terrain, and you’re not too sure if you can trust them in such conditions, then side with the front attachment variety. However, if your pooch has experience exploring the great outdoors, and you feel confident with them, then go ahead and try a back attachment harness. Or, one option I strongly recommend is a restraint that has both front and back attachments. What I like about a harness that features a 2-point attachment system is that you can alter where you attach the lead whenever you want. 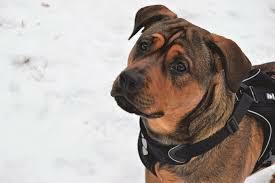 For instance, I know of some pet parents that will go from attaching the lead from the back to the front of the harness if a trail appears more dangerous and challenging than what their pet is accustomed to. The size and fit of your pet canine’s hiking harness are significant. You don’t want it too tight and sturdy, or else you risk restricting your pup’s breathing and causing discomfort. A restraint that is too loose may result in undesired chafing, or your pooch might not be able to stay put. Back Length – This is the length from the base of the neck to about the base of the tail. Chest Girth – Is the circumference of the canine’s rib cage at its widest point. Neck Girth – Is the circumference of the dog’s neck. I measure where my pet’s collar usually sits. Sometimes, a common issue customers face, after taking their hound’s measurements and finally making the decision of which product to get, is they find their dog in between sizes, not sure of which size to get. Once again, check with the manufacturer to see what they suggest. Some companies recommend sizing-up, while some say pick a size down. But if it just doesn’t work out, the majority of companies have a generous return policy. Also, if you’re purchasing this for a dog that is still growing, then pick a restraint that it can grow into. Make sure it has many adjustable straps and that each size covers an appropriate range. For example, a size small might be suitable for dogs with a chest circumference of 17-22 inches. Once you receive the product and begin fitting and molding it to your canine’s body, I use the two-finger rule. Which means as long as you can comfortably fit two fingers anywhere between the harness and your dog, then you’re all good. Keep in mind that it is all about comfort. Another important criteria I prioritize is the quality of the material. I look for gear that uses premium material that is durable, easy to clean, comfortable, and breathable. For durability, a good example would be reflective nylon oxford material. The material will not corrode, extending the life of the product. As far as comfort, I suggest looking for a restraint that has foam or soft-sponge padding in the straps. The extra cushion ensures your dog stays comfortable for extended periods of time. A material that is breathable and lightweight is mesh. If you’re hiking in the rain or will traverse a body of water, the mesh will not retain water, which creates extra unnecessary weight. Of course, there are other types of materials that are light in weight and breathable, but if you’re still having trouble deciding on a specific material, then look for one that is easy to clean and care for. Some products can be machine washed, while some require to be hand-washed. I personally never throw my harness in the dryer, due to the fear of it shrinking, so I always hang it out to dry. To further prevent shrinkage, machine wash in cold water and depending on how dirty your harness is, pre-soak in detergent in a separate wash bucket or container. Try to remove any extra fur, dirt, and dander before placing in the washer, so you don’t carry those over into the washing machine. You don’t want to contaminate your household appliance with fur. Before going outdoors, make sure you have the right gear for hiking with your dog. 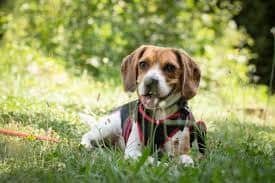 Especially when it comes to selecting the right dog harness for hiking, one must consider factors such as comfort, durability, and most importantly, safety. Like harnesses for running, these types of gear have at least one safety feature. 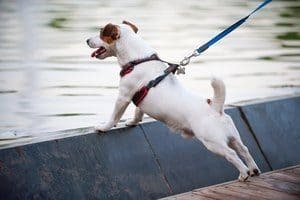 If you’re taking your pet where they’ll need to swim during an adventure, then you want to look into buying life vests. Again, you always want to be prepared whenever you go on outdoor hikes. Especially if there are unexpected lakes during the hike. Your pet’s safety should always be a priority. Look for a restraint that has safety buckles that feature some form of a locking system. This kind of protection ensures your pet won’t wriggle out and escape the harness and possibly run into a dangerous situation. Also, it’s good to choose a product that’s constructed with some type of reflective material, such as nylon or 3M material. Reflective material keeps your dog visible at all times, especially at night. Also, make sure the straps actually serve a purpose and function. Do they look secure, functional and sturdy, or look like they serve no purpose at all? It’s crucial that you learn how to put a harness on your dog. The last thing you want is for a strap or buckle to break, and your pet gets loose and runs away while you’re on a hike. If your pet constantly pulls on the lead, then consider looking into no-pull harnesses to ensure you have the best equipment to keep your pet safe and comfortable. If you still can’t decide which one is best, I strongly suggest the Earth Vibes Petfly. It’s durable, comfortable, and keeps your pet safe at all times. Consider your preference, the size of your breed, and if it has a tendency to pull on a leash. Make sure to review the safety features and size carefully so you and your pet can enjoy going on outdoor activities together. I've been a college grad for over 4 years now. I'm a full-time contributor for puppypointers and I absolutely love it.I enjoy meeting people from all over the world, especially those that have a warm heart for doggies.When I'm not writing, I spend a lot of time at the beach in sunny California.